I made my first Bored Vegetarian post on May 3rd, 2010, a little over a three years ago! Without getting too cheeseball (mmm cheeseball), I can’t thank you enough for reading and cooking along with me. Can’t wait to see where this goes over the next few years . . . I intended to go running after work… made this instead. Stomach: 1 point, Health: 0 points. Preheat oven to 400 degrees. Follow defrosting instructions on puff pastry box. Once you’re able to unfold it, lay it out and cut two 4×4 squares (or circles! or hearts!) Place on a greased or parchment-line baking sheet. In a small bowl, whisk together the egg and water. Brush the tops of each of the squares with the egg wash. Bake in the oven for 10-15 minutes or until puffy and browned. Remove from oven and set aside. In a bowl, mix together ricotta and thyme. Season with salt. 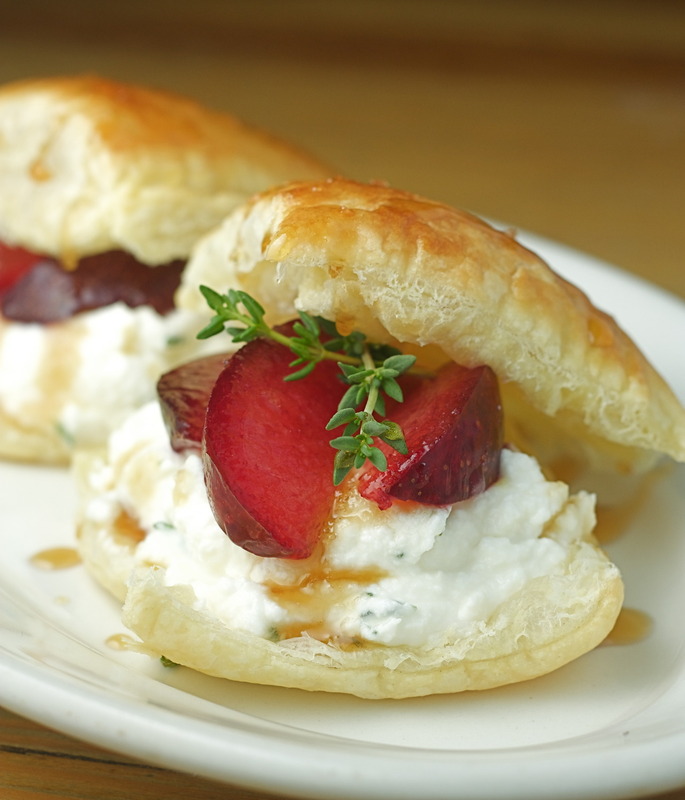 Cut plums into wedges. 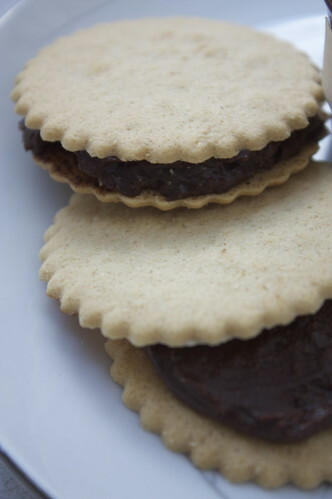 Take each puffed pastry and pull the top off so that there’s two halves. Scoop ricotta mixture into bottom half and layer with red plum. Place the top half back on and drizzle with honey before serving. Making homemade “nutella” for tomorrow night’s dinner. I get to lick the spoon. This evening, in the middle of watching Tommy Boy with Mads, I decided to make a chocolate souffle. Preheat the oven to 375 degrees. Lightly coat six 1 cup souffle dishes or ramekins with cooking spray or coat a 6 cup souffle dish with the spray. In a small bowl combine the cocoa and hot water, stirring until smooth. Set aside. In a small heavy saucepan over medium heat, melt the butter. Add the canola oil and stir to combine. Add the flour, ground almonds, and cinnamon and cook for 1 minute, stirring constantly with a whisk. Stir in the brown sugar, honey and salt. Gradually add the milk and cook, stirring constantly until thickened, about 3 minutes. Remove from the heat and stir into the cocoa mixture. Let cool slightly. 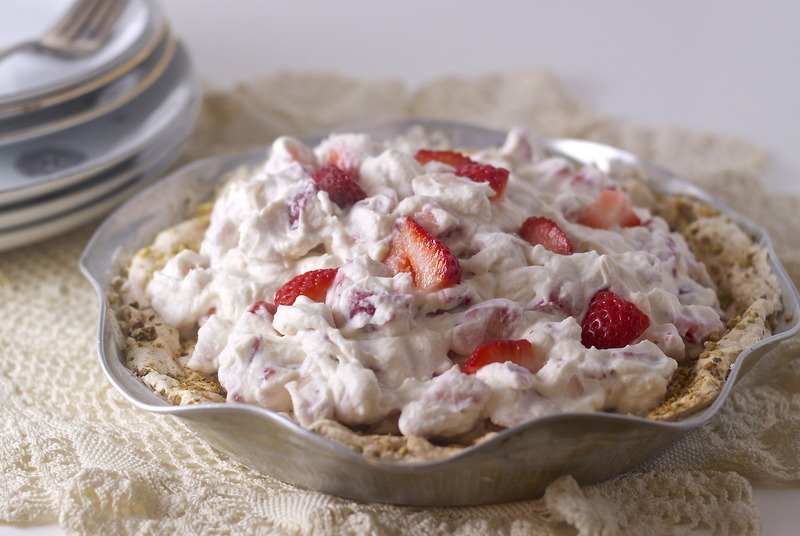 In a large spotlessly clean bowl, using an electric mixer on high speed, beat the egg whites until foamy. Add the granulated sugar, 1 tablespoon at a time, and beat until stiff peaks form. 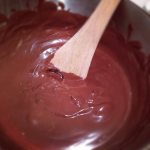 Using a rubber spatula gently fold one-third of the egg whites into the cocoa mixture to lighten it. Then fold the remaining egg whites into the cocoa mixture, mixing only until no white streaks remain. Gently scoop the cocoa-egg white mixture into the prepared dishes (or dish). 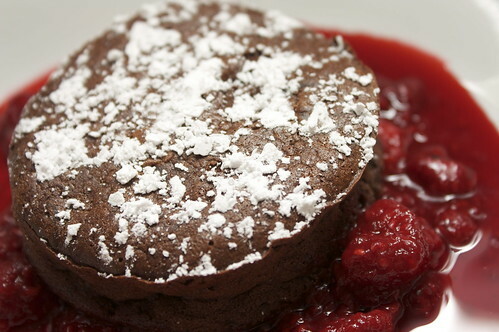 Bake until the souffle rises above the rim and is set in the center 15-20 minutes for individual souffles or 40-45 minutes for large souffle. 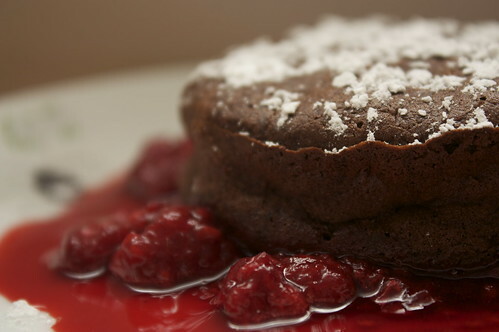 Using a fine mesh sieve, dust the top with confectioners’ sugar. 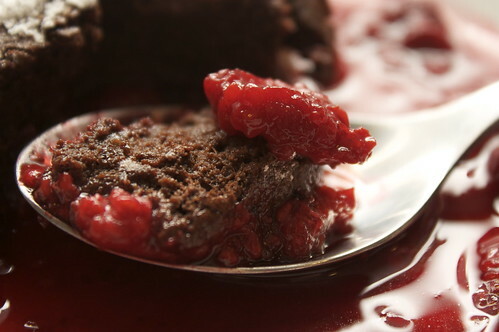 Serve immediately, garnished with the raspberries. Though I still need to perfect my folding technique (I deflated the egg white a bit too much, which meant the souffles didn’t raise as high,) the souffles were light and spongey and not too sweet. I warmed up some frozen raspberries with granulated sugar and used that as a sauce. I had high hope to make a powdered sugar snowflake on the top (to bid adieu to winter?) but that didn’t work out as planned. Baby steps.I’ve been watching a lot of Food. Curated. videos lately and recommend you check them out too! 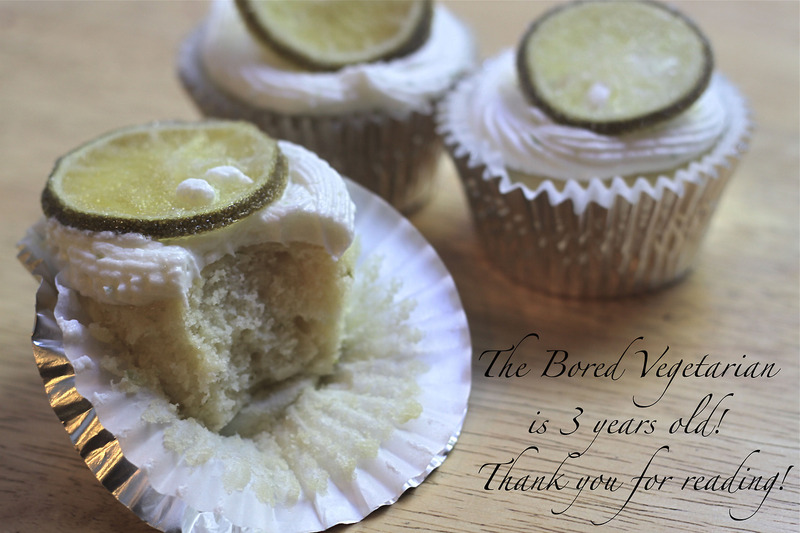 It’s a great way to find out about the amazing foods people are making locally (like my personal fave, Robicellis cupcakes) and get to know the people behind the scenes. There’s a lot of Greenpoint love! 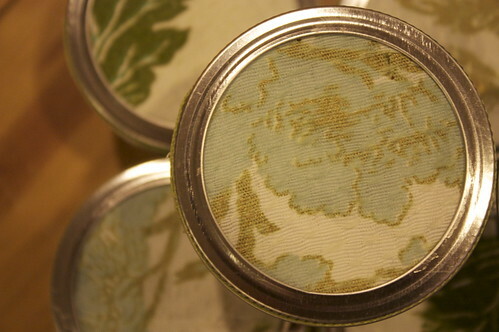 I found some small jelly jars at Cheap Charlie’s on Manhattan Ave, and used some vintage curtain fabric and simple ribbon to decorate them. The recipe makes about a cup, so I quadrupled it. I knew this would be in high demand. Add hazelnuts to the bowl of a food processor. Pulse until it becomes a smooth peanut butter-like consistency (no joke! You want this as smooth as possible.) Add the melted chocolate (double boiler! ), cocoa, sugar and vanilla. Process until smooth and well-mixed. Add bourbon slowly. This’ll change the texture, so the vegetable oil will be essential to ensure a smooth, shiny consistency. 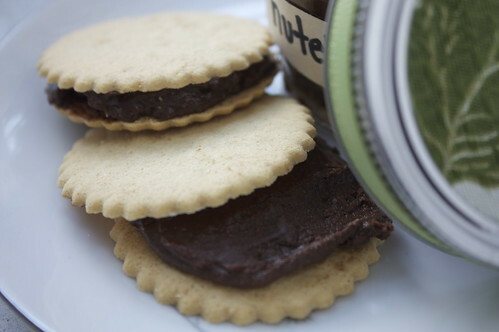 Add vegetable oil one drop at a time, and pulse to a smooth, spreadable consistency, if necessary. 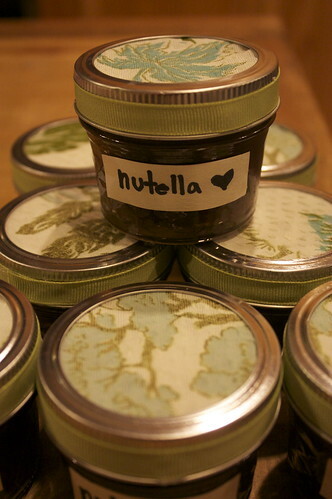 Store in a tightly sealed glass jar and use as desired. Colleen and Patty arrived from North Carolina yesterday and I greeted them with “Welcome to Greenpoint” care packages – Polish chocolates, a packet of red borscht, a Zywiec beer and a jar of “Nutella.” They brought me sugar cookies, Southern dumplings, chocolate from Germany and Hush Puppy mix. Let’s just say that all three of us were happy with our gifts. We got to attend a taping of The Daily Show yesterday and then spent the rest of the evening exploring the neighborhood and catching up. Tomorrow we plan on visiting the American Museum of Photography and taking some pictures of our own around Chinatown. I’ll be DJing Digital DUMBO with my friend Ian next week. If you want to come network with other tech nerds, have some drinks and listen to me play late 90’s indie rock, RSVP here! I’ve only been in New Orleans a little over 24 hours and I’m already falling in love. I have the greatest hosts imaginable: Chris, who runs local label Park the Van, his charming and amazing tour guide wife Sabrina, their dogs Taco and Sophie and two cats (who have been giving me dirty looks for invading their space.) They’ve already taken me around various parts of the city and last night, they took me to Herbsaint. Sticky rice cake, sauteed bitter greens, browned cauliflower & mushrooms, topped with pickled squash. One of the best vegetarian meals I’ve ever had and it was made up on the fly. I literally wiped the plate clean with a piece of bread. My compliments to the chef. My fumbling, gushing, compliments. Based on my meal, you’d think I would have believed Sabrina when she told me their Banana Browned Butter Tart was life-changing. I didn’t. And I was wrong. We got a selection of desserts – pumpkin tart special, fried apple pie with frozen yogurt – along with the banana tart. They were all delicious, but the banana tart was what I can only describe as a religious experience. The buttery crust literally melted in my mouth. I kept telling myself to keep it together so that the restaurant wouldn’t see my eyed rolling into the back of my head. Noah even made it “Elvis style” with peanut butter ice cream on the side. Are you kidding me? Herbsaint. New Orleans. Banana Brown Butter Tart with Fleur De Sel Caramel. Life changing. You may not believe me, but just you wait.